These preschool Bible lessons are created and used at home, so there are some basic preschool learning skills printables added to each post. 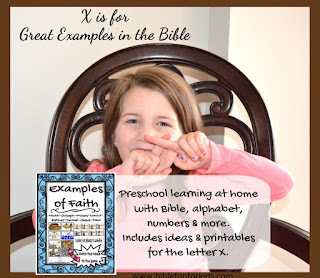 The Bible lesson and Bible printables are suitable for home or Bible class use. This week we talked about the letter X and they loved making the X with their fingers! Noah: Obeyed God and built the ark. Exactly as God told him to. Joseph: Did what God wanted, set a good example in Egypt and was able to take care of his family. Moses: Obeyed God and took the people away from Egypt after the 10 Plagues. God gave Moses the 10 Commandments. David: Believed in God and knew that God would help him win the battle against Goliath. Esther: Had faith in God. She set a great example by asking God in prayer to protect her people. She was well liked by the people. Daniel: Continued to be faithful and prayed to God, even when the law said he wasn't allowed to. God protected him from the lions when he was put in the lion's den. Jesus: Came to earth and lived sin free. He helped heal people with miracles and did exactly what God wanted. After He died, Jesus went to heaven to be with God, His Father. Paul: Once Paul became a Christian, he was faithful. No matter what anyone did or said to him. Paul & Silas was thrown in prison where they sang and prayed to God! Because of their faithful example, the jailor believed in God and was baptized. The color and black & white is included in the download here. He brought his xylophone for us to use for the letter x. I found the template here for the xylophone. I cut their parts to match the toy. Part of what we did with the xylophone was I said "Show me a yellow" and they (taking turns) would hit the correct color. They had a lot of fun with that and didn't even realize it was for learning! 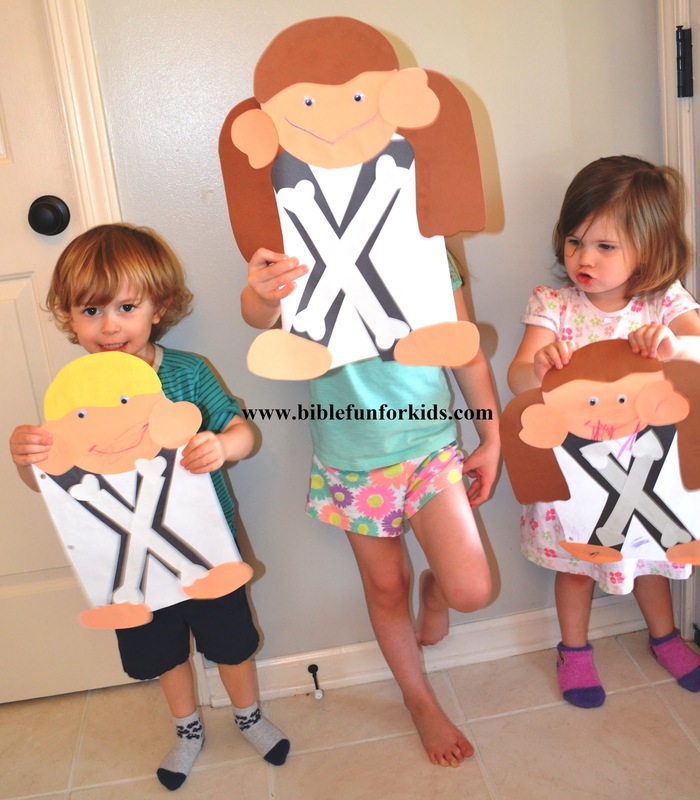 X is for X-ray! I purchased the X-ray paper bag puppets here. They love them! The X-ray people can be found here. Also, you will find the free Alphabet Hats here. They love the long legged thingies, so I make them when I can! I used the Long Legged Hexagon for X. Click here to download the template. 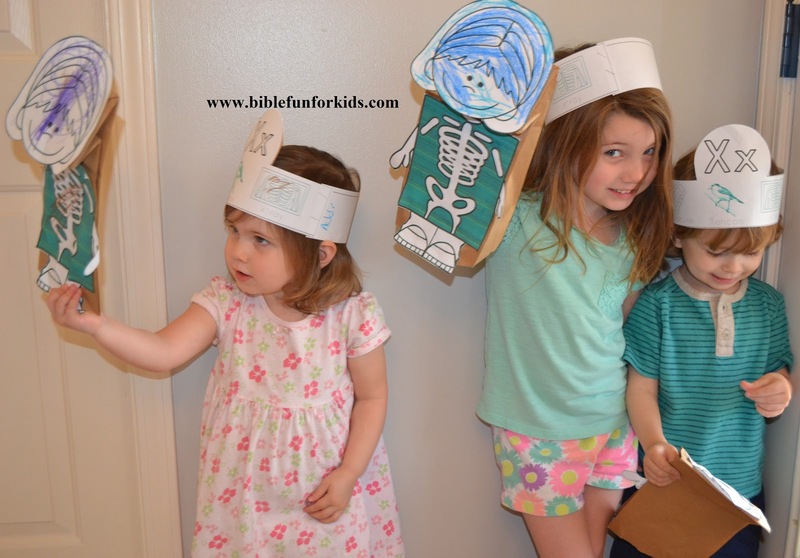 We found these Cheetos Bag of Bones at Wal Mart this year and there are so many lessons they can be used with! I found the free printables here that you see. This was fun and delicious! You can see more on my X is for... Alphabet Pinterest board here. Well done! X can be such a tough letter. Thanks for sharing. Thank you Lexie for the comment! I appreciate you stopping by! Thanks for the comment1 I love the x idea and if I remember, I will use that for next year! Sounds like fun! Newest follower from Happy and Blessed Home hop!